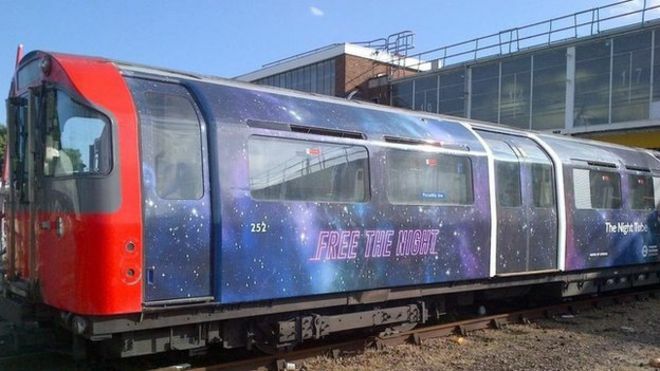 The launch date of London's Night Tube is to be delayed. The 24-hour weekend service on the Jubilee, Victoria and most of the Piccadilly, Central and Northern lines was due to start on 12 September. LU said it had deferred the introduction to "allow more time" for talks with the unions. On Monday a further two 24-hour Tube strikes planned for this week were called off after discussions between LU managers and Unite union, the train drivers' union Aslef, the Transport Salaried Staffs Association (TSSA) and the Rail, Maritime and Transport Union (RMT). LU managing director Nick Brown said: "Further to the progress made in recent days with the trade unions and the suspension of strike action, we believe we are not far from an agreement that protects the work-life balance of our employees and is affordable, sustainable and fair. "As such, we have decided to defer the introduction of Night Tube to allow more time for those talks to conclude. "Our objective is to reach an agreement that ends this dispute and delivers the Night Tube for Londoners this autumn." London Mayor Boris Johnson said: "As I've previously made clear, I'm not interested in a staring match over 12 September and I want to see night Tube introduced this autumn. "Agreement on this is in everyone's interests - Londoners, businesses, visitors to our city and the hard-working London Underground staff who are central to making this happen." He added further strike action "isn't going to benefit anyone". He said: "It has to be done in a way that works for London Underground, for passengers, and also for the drivers who deliver this service every day. "Had LU not acted in bad faith, by trying to introduce the Night Tube in London without consultation, and without negotiation, we wouldn't be where we are today and they would have been in a position to deliver." However, the RMT has set two new Tube strike dates of 8 and 10 September if no agreement is reached. RMT general secretary Mick Cash said: "RMT welcomes this move, which is what we have been calling for ever since we went into dispute over the night Tube issue. "We warned repeatedly that it would be dangerous and foolish to press ahead with bodged night Tube plans until the very basics in terms of staffing and safety had been agreed with the unions through the long-established frameworks." The RMT added the move mean its members were "right to strike". David Leam, of business group London First, said: "This is disappointing for businesses, but if it gives London Underground and the unions time to come up with a long-term deal it will be worth it." Liberal Democrat London Assembly member Caroline Pidgeon said the move was a "big climbdown for the mayor" and "strengthened the union's negotiating position". Labour's London Assembly transport spokeswoman Val Shawcross, said the deferral came as "little surprise". She added: "If you try and launch a major project without speaking to the people you'll be relying on to deliver it, it's never going to end well." In September 2014, TfL announced the Night Tube would run on Fridays and Saturdays with six trains per hour through central London on five Tube lines, while on the Northern Line, there would have been eight trains an hour to meet demand at busy stations between Leicester Square and Camden Town.